, corresponding to C terminal amino acids 1326-1345 of Mouse VEGF Receptor 2. Isoform 1 localization: Cell membrane; Single-pass type I membrane protein. Cytoplasm. Nucleus. Cytoplasmic vesicle. Early endosome. Note: Detected on caveolae-enriched lipid rafts at the cell surface. Is recycled from the plasma membrane to endosomes and back again. Phosphorylation triggered by VEGFA binding promotes internalization and subsequent degradation. VEGFA binding triggers internalization and translocation to the nucleus. Our Abpromise guarantee covers the use of ab2349 in the following tested applications. 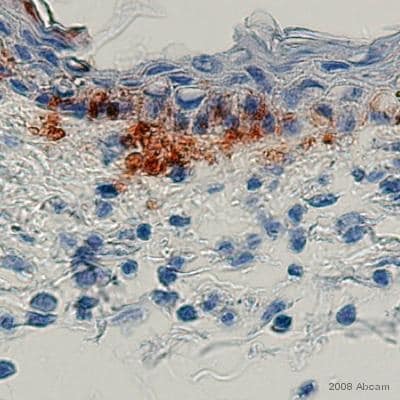 ab2349 staining the VEGF Receptor 2 in Mouse skin tissue sections by Immunohistochemistry (IHC-P - formaldehyde-fixed, paraffin-embedded sections). Tissue was fixed with formaldehyde and blocked with 10% serum for 1 hour at room temperature; antigen retrieval was by heat mediation in citrate buffer (pH 6). Samples were incubated with primary antibody (1/100 in PBS + 2% blocking serum) for 16 hours at 4°C. A biotin-conjugated Goat anti-rabbit IgG polyclonal (1/250) was used as the secondary antibody. 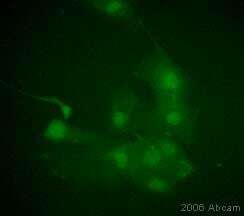 Immunocytochemistry/ Immunofluorescence - Anti-VEGF Receptor 2 antibody (ab2349)This image is courtesy of an anonymous abreview. 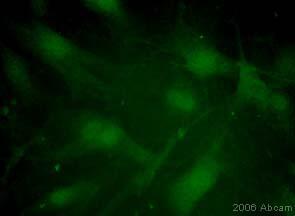 Immunocytochemistry/ Immunofluorescence analysis of human cardiomyocytes labeling VEGF Receptor 2 with ab2349 at 1/400 dilution. Cells were fixed with acetone and blocked with 5% serum for 1 hour at 25°C. Cells were incubated with ab2349 at 1/400 for 24 hours at 4°C in 10% FBS. 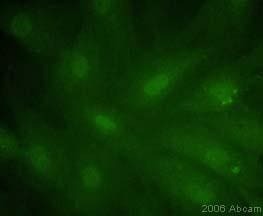 A polyclonal goat anti-rabbit IgG Alexa Fluor® 488 conjugate was used as the secondary antibody at 1/1000 dilution. 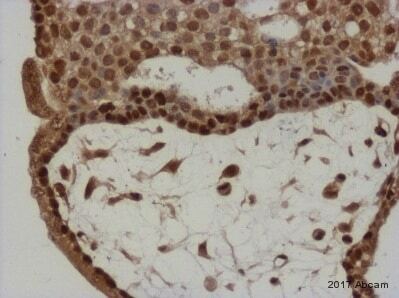 Immunohistochemistry (Formalin/PFA-fixed paraffin-embedded sections) - Anti-VEGF Receptor 2 antibody (ab2349)Image from Arias-Pulido, Hugo et al., BMC Cancer 12 (2012): 298. PMC. Web. 25 Jan. 2017. doi: 10.1186/1471-2407-12-298. Fig 1I. 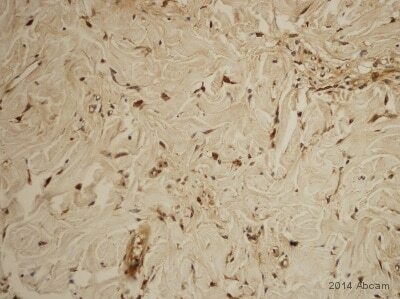 Immunohistochemistry (Formalin/PFA-fixed paraffin-embedded sections) analysis of human normal breast tissue labeling VEGF Receptor 2 with ab2349 at 1/200 dilution. Sections were lightly counterstained with hematoxylin. 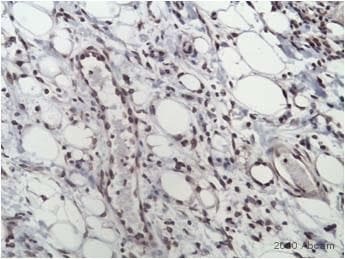 Immunohistochemistry (Formalin/PFA-fixed paraffin-embedded sections) - Anti-VEGF Receptor 2 antibody (ab2349)Image from Arias-Pulido, Hugo et al., BMC Cancer 12 (2012): 298. PMC. Web. 25 Jan. 2017. doi: 10.1186/1471-2407-12-298. Fig 1H. ab2349 at a 1/100 dilution staining Human choroidal endothelial cells by Immunocytochemistry. 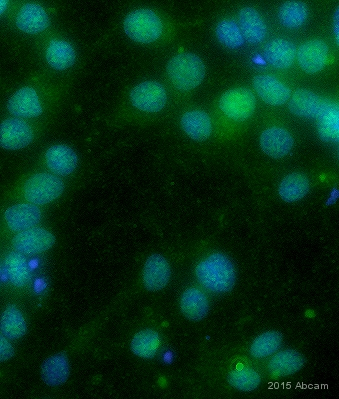 The antibody was incubated with the cells for 3 hours and then detected using an Alexa-Fluor 488® goat anti-rabbit (IgG). This image is courtesy of an Abreview submitted on 27 February 2006. Publishing research using ab2349? Please let us know so that we can cite the reference in this datasheet.